Cristina Mamani is the new face of justice in Bolivia. 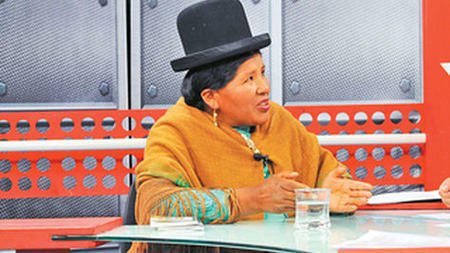 A 46-year-old lawyer and mother from the Bolivian highlands who wears the traditional dress of her native Aymara culture, Mamani was the top vote-getter last October 16, when Bolivia became the first nation in the world to elect its highest-ranking judges by popular vote. On January 4, Mamani was elected by her peers to serve as president of the Judiciary Council, one of four top courts (including the Supreme Court, the Constitutional Tribunal, and the National Agro-Environmental Court) that now have elected authorities. “I will serve the poorest people,” she said in an interview last October. “I studied law because many people, especially peasant women, suffer from abuses [and need to be defended].” Cristina Mamani, President, Judiciary Council. Credit: La Razón. Of the 56 newly-elected judges, 50% are women and 40% are indigenous. 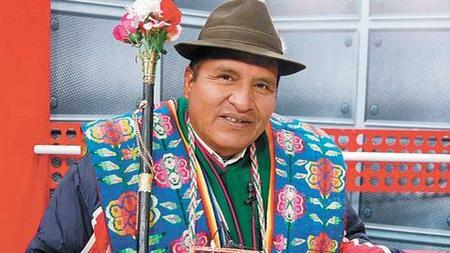 They were sworn in January 3 in a ceremony led by President Evo Morales, who urged them to serve the people. The new judges have to “change the image of Bolivian justice,” Morales said, which has been tarnished for years by allegations of corruption, inefficiency, privilege, and discrimination against the country’s indigenous majority. It’s a tall order, to say the least. While Morales emphasizes that the judicial elections have strengthened Bolivian democracy, the new justices begin their terms under a cloud of illegitimacy—since only 41% of Bolivian voters cast valid votes in the October elections, while 42% voided their ballots and 17% left them blank. This outcome resulted from a strong campaign by opposition parties to turn the judicial vote into a referendum on the Morales government, along with widespread dissatisfaction over Morales’s handling of the TIPNIS conflict and voter confusion that the opposition was able to exploit. Following the vote, opposition leaders sought unsuccessfully to invalidate the election results (Bolivian law clearly provides for election of judges based on the percentage of valid votes cast). Critics charge that the election will reduce the independence of the judiciary, since the candidates—while officially non-partisan—were chosen by the Movement Towards Socialism (MAS)-controlled Congress. But prior to the new judicial election system, which is mandated by Bolivia’s 2009 Constitution, Congress chose the judges directly, allowing dominant coalition parties to negotiate their respective quotas. According to the Cochabamba-based Andean Information Network (AIN), the new election guidelines disqualified candidates with recent political affiliations, and provided mechanisms for citizen review and comment on individual candidates. Of the 541 original candidates, 465 were in fact eliminated through the screening process. Bernardo Huarachi, President, Agro-Environmental Court. Credit: La Razón.The election process was overseen and ratified by four international organizations: the Organization of American States (OAS), the Andean Community of Nations (CAN), the Andean Parliament, and the Union of South American Nations (UNASUR). In AIN’s view, the new system, while imperfect and cumbersome, is “decidedly more democratic and inclusive.” Ironically, though, as AIN points out, by encouraging voters to void their ballots, the opposition parties greatly increased the odds that pro-MAS candidates would be elected, creating a less representative result—and a self-fulfilling prophecy. Among the many systemic challenges that the new judges will face, AIN notes, are the judiciary’s chronic underfunding, delays that appear endemic to the system, and potential pressures from social movements and other interest groups who may seek to influence decisions. As Morales himself has cautioned, indigenous judges bear a special responsibility to avoid making mistakes that could compromise the “moral integrity” of the campesino movement. Whether Bolivia's newly elected judges can overcome these obstacles and have an opportunity to succeed, especially in the currently polarized political environment, remains to be seen. In the meantime, the new faces of justice—like Evo Morales himself—serve as an important reminder to ordinary Bolivians of the political and social gains they have recently accomplished. Read more on the TIPNIS conflict on Emily Achtenberg's blog, Rebel Currents, or check out our November TIPNIS photo essay. See also, the November/December 2011 NACLA Report, "Road Rage and Resistance: Bolivia's TIPNIS Conflict" Or subscribe to NACLA.